IN THIS ONE... 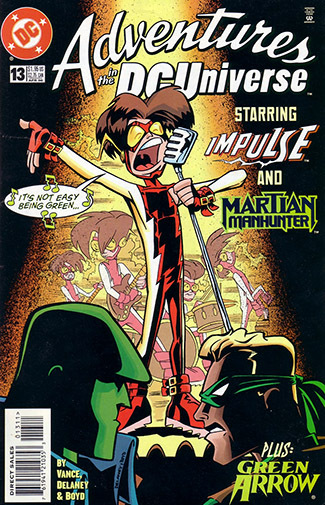 Impulse and the Martian Manhunter work a case in the music industry; Green Arrow fights a villain who can make him blind. REVIEW: Impulse's regular title is already pretty "animated", Delaney pushing the art only an inch from where Humberto Ramos already had it. Bart's thoughts shown in pictograms aren't a cartoony innovation for Adventures; Waid and Ramos were doing it in Impulse. While it's still fun here, it only goes so far, and between the exposition-heavy plot and the more intellectual Martian Manhunter guest-starring, the issue comes across as very, very wordy. Is it Bart's fate to always have an older, more conservative hero looking over his shoulder and telling him to slow down? If it's not Max Mercury, it's J'Onn J'Onzz, and it makes sense he would empathize with the band inspired to take his name because they have to contend with an older manager. Alas, the cover image doesn't come to pass, and instead, it's a detective story with gangsters and over-ambitious agents... Some nice humor, but the mystery plot keeps it far too grounded. 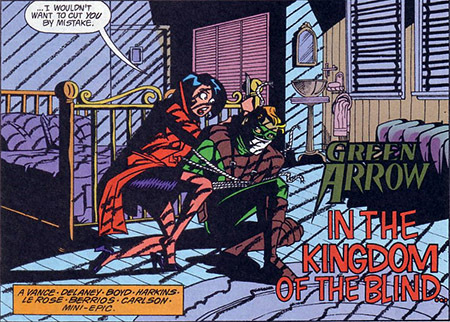 Green Arrow Connor Hawke stars in "In the Kingdom of the Blind", a story that starts in medias res and asks you to catch up quickly. It actually works in its favor, because we're more likely to trust the character of Natalie Faltz if Connor does, and he doesn't know until it's too late that she's a villain called Nightfall who can take away his sight temporarily. Most of the action then become about Connor overcoming this handicap (he always was a zen-type character) and shooting blind. 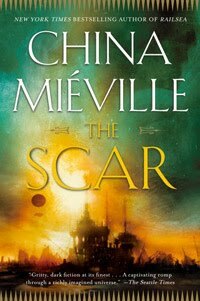 As with other back-ups, it's kind of short and cursory, but it's got a good finale (with a fake-out moment where WE are blind to the situation) and promises to bring Nightfall back (we'll see if they did). IN THE MAINSTREAM COMICS: To be contradicted later, the Green Arrow in this issue isn't Oliver Queen, but his illegitimate son, Connor Hawke, who held the title in this era. DC has a character called Nightfall who is a member of the Cadre and doles out darkness, but Natalie Faltz seems to be a different, original character. REREADABILITY: Medium - Doesn't necessarily play to its lead's strengths, but still an enjoyable pair of stories.